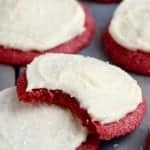 These Red Velvet Cookies are all the delicious flavor of red velvet, buttery soft, and crisp on the outside. Topped with some of the best cream cheese frosting! AMAZING! They are based off my sugar cookie recipe and they are totally amazing! Frosting with cream cheese frosting. Nutritional information is for one cookie, unfrosted.